Snake Rattle and Roll is a Novomatic-powered online slot that provides players with a thrilling gaming experience. The game is loaded with impressive bonus features, including free spins and a board game bonus to keep the wins coming every time you spin the reels. Read our full review below. Snake Rattle and Roll is a fun online slot from Novomatic with 20 generous paylines. The game offers up all sorts of great winning potential in the form for base game features, a free spins round and a board game minigame! 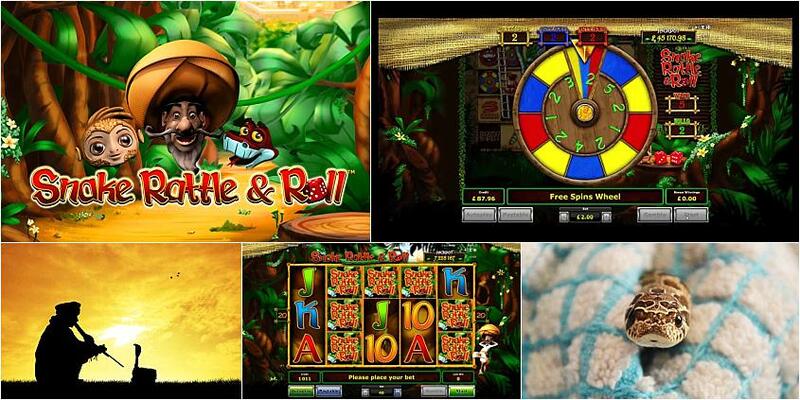 Snake Rattle and Roll is a vibrant online slot with an exotic theme set in the jungle. The game takes you on an exciting journey as you encounter all sorts of jungle creates like snakes and monkeys. There are some impressive 3D graphics that are sure to keep you entertained. While Novomatic is known as a classic slots game developer, the provider has done an impeccable job in creating a game that will impress modern players. There are 20 paylines in Snake Rattle and Roll from Novomatic, so you’re in for a fantastic online gaming experience with plenty of generous winning potential. You can wager upwards of 20p and the maximum bet of £300 will certainly appeal to high rollers. What’s great about this online slot is that you can set a Reality Check time interval as soon as you boot up the game. From 15 minutes to 2 hours, the reality check limit will remind you at these intervals of how long you have been playing. It is a useful tool that will encourage responsible gaming. When three dice symbols land on the reels, you’ll be taken to a board game bonus which plays out exactly like a game of Snakes and Ladders. As you make your way around the board, you’ll collect cash prizes, more dice rolls, free spins and extra wilds. There is even a progressive jackpot up for grabs! When you trigger the free spins bonus, you can collect additional spins by collecting basket symbols on the fifth reel. The game provides you with all sorts of amazing ways to win big, and the free spins bonus really boosts your odds of hitting great prizes. Like all Novomatic slots, Snake Rattle and Roll is available to play on both mobile and desktop devices. The game is browser-based, so you can give it a spin without having to download any software or wondering if it will be compatible with IOS, Android or Windows devices. You can play Snake Rattle and Roll and a wide range of other Novomatic slots at Viks Casino. This top-rated online gaming site offers up hundreds of amazing games to play for free, and provides you with the chance to take advantage of impressive promotions every week. * Snake Rattle and Roll trademark / license is owned by Novomatic. This site is not endorsed by Novomatic.